Black Diamond Absolute Mitts. From the top of Everest to wind-swept Antarctic ice fields, the waterproof and ridiculously warm Absolute Mitt is designed for the world’s harshest environments. 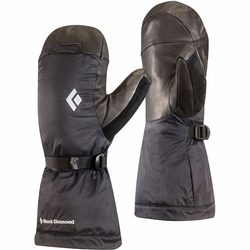 BD's warmest and lightest expedition mitt that will keep your hands warm and dry with minimal weight (and can also serve as a really lightweight packable stash mitt for emergencies).